Fashion 10-12mm green turquoise gemstone Chunk Necklace Tibetan Silver 18"
Length: 18". We will respond within 24-48 hours, in most cases sooner. size(Appro. ). 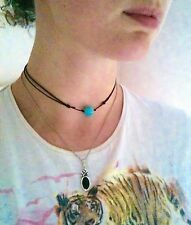 Beautiful handmade ladies turquoise bead choker on a black cotton cord. ☆ Adjustable slip knots on a black cotton cord: Can be worn as a choker to a low hanging pendant. However, we could solve the problem within 24 hours. If you hope to get the item earlier, EMS is also available. We will do as we promised for you. Classical Western Cowboy Bolo Tie Design. Rope Length:102cm (40 in). Closure: Slide clasp. Stone: Turquoise. Braided leather Cord. Stunning jewellery semi precious turquoisehand knotted round bead gemstone choker necklace with a large spring ring clasp. Approx length:Necklace 50 cm with 1 cm round bead stones. Colour of this necklace may vary as it is 100% natural product. Material: Alloy,Turquoise. Style: Fashion. Color: Show as pictures. Surfer Coconut Bead Beaded Necklace 19". 4mm ~5mm Mixed Coconut Beads. decorated with Hematite Natural Turquoise Gemstone Bead. Handmade By TaKuKai Beads UK. 19" Long Unfastened. Finish With Stainless Steel Findings. Length: 15". We will respond within 24-48 hours, in most cases sooner. size(Appro. ). Stunning jewellery genuine semi precious turquoise chunky large flat abstract shape stone choker necklace. Colour of this necklace may vary as it is 100% natural product. Approx length: Necklace 48 cm long and stone size: 4 cm x 3 cm. Material: turquoise, Coral. Beads Size: as the picture show. color: green. market, there are a large number of materials and factory cooperation, to ensure product quality and speed of the order!Integrity, quality, after-sale, is our pursuit! Decorated withSynthetic Hematite Beads Finish With Stainless Steel Findings. Handmade By TaKuKai Beads UK. 4mm Dyed Green TurquoiseNatural Gemstones. Stunning jewellery genuine semi precious turquoise chunky large oval shape stone choker necklace. This stunning eye catching fashion necklace jewellery will finish off any outfits beautifully. All our fashion jewellery are nickel free in line with the EU standards. Length: 80". We will respond within 24-48 hours, in most cases sooner. Quantity: pcs. Bohemian style. 1 x Turquoise Arrow Necklace. Wonderful gift for your lover,family,friend. Material:Turquoise Alloy. We will try our best to reduce the risk of the custom duties. Special design and unique structure, a popular item. Nature Gemstone 14-14.5mm Turquoise necklace Round Caving beads Jewelry 19"
Material: Nature Turquoise. Style: Beads Necklace. Gem Size: about 14-14.5mm. Shape: round. Length : 19". correct and valid. Main Color: blue. 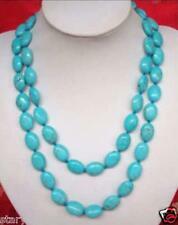 Beautiful 8mm Round Turkey Turquoise Gemstone Necklaces50"
We will respond within 24-48 hours, in most cases sooner. length: 50". Quantity: 1pc. Colour of this necklace may vary as it is 100% natural product. This stunning eye catching fashion necklace jewellery will finish off any outfits beautifully.